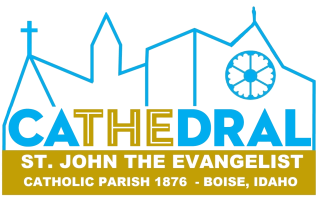 This rewarding Ministry is an Outreach effort to welcome visitors both Catholic and non-Catholic to St. John's Cathedral, the only Roman Catholic Cathedral in the Diocese of Idaho. The structure as we know it today was begun in November 1906 with the laying of the cornerstone, which is visible today, and was completed and dedicated in 1921. Seeing a need for offering Docent-led Tours for groups and visitors, parishioner Michael Kurdy founded the Docent Ministry in 2002. He collaborated with parishioner Charles Hummel in 2003 to research, write, and assemble a Docents Manual that includes the basics of "everything you wanted to know about the history and construction of the Cathedral of St. John the Evangelist in Boise ID." Ministry offers customized tours on weekdays and Saturdays. We frequently give group tours to church groups of all denominations, public, private, and parochial school groups of all ages, college classes, family reunion groups, and choirs who always want to experience singing in the Cathedral with its perfect acoustics. Docents are on duty at regularly scheduled Sunday afternoon Architectural Tours which are available to drop-in visitors from 3:00-4:30 pm. These tours focus on the Cathedral's stained glass windows, the Romanesque architectural style, the construction materials, the artwork and symbolism, the 1979 renovation, and some of the Cathedral's history.